The late eighteenth century was one of the most exciting and unsettling periods in European history, with the shock-waves of the French Revolution rippling around the world. As this collection of essays by leading scholars shows, Wales was no exception. From political pamphlets to a Denbighshire folk-play, from bardic poetry to the remodelling of the Welsh landscape itself, responses to the revolu… tionary ferment of ideas took many forms. We see how Welsh poets and preachers negotiated complex London-Wales networks of patronage and even more complex issues of national and cultural loyalty; and how the landscape itself is reimagined in fiction, remodelled a la Rousseau, while it rapidly emptied as impoverished farming families emigrated to the New World. 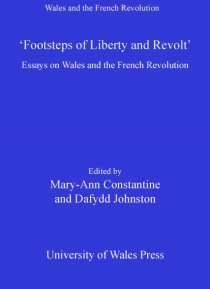 Drawing on a wealth of vibrant material in both Welsh and English, much of it unpublished, this collection marks another important contribution to 'four nations' criticism, and offers new insights into the tensions and flashpoints of Romantic-period Wales.